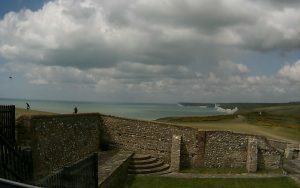 In 1835 the lighthouse was around 34m from the edge of the cliff and in 1890 it was just 30m. Bring that forward to the present day and in 1997 the lighthouse was perilously just 3m from the edge. 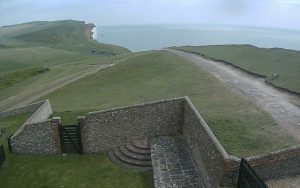 The impressive engineering results of Abbey Pynford moved the whole lighthouse back some 17m and due to the natural erosion of chalk it is certain that the lighthouse will again be at risk from certain destruction in the future*. In 2032 the Belle Toute Lighthouse will be 200 years of age and it would be nice to think that the lighthouse will continue to be looked after and protected to proudly reach this ripe old age. Further information on the chalk cliffs is available here from the Applied Geology Research Unit (AGRU) of Brighton University. *Please note: Previously I estimated the erosion based on .5m to 1m per year suggesting that the lighthouse would need to be moved in 17 to 34 years. This was based on my own calculations during 1890 and 1997, internet research and taking into account global warming. An erosion report that has come to my attention actually states that the erosion rate is more likely to be 0.03m to 0.27m per year depending on whether it is an ‘active’ or ‘passive’ recession period. My own analysis suggests the average rate of erosion rate is .6m per year. This would suggest at a current distance of 18.2m that the lighthouse will need moving again in just under 30 years. More likely in around 24 years as it would be necessary to ensure access to the front of the tower by which time there should be 3.6m distance from the cliff edge. It is important to recognise that averages are based on the middle value of a series of figures, although these figures are based on what has happened rather than what yet will happen. For example if within 100 years there was 50m of cliff that disappeared then the average is .5m per year, however, we know that falls can precede the average, i.e. that in 10 years there might be a cliff fall of just 1m but in the next 10 years there might as much as 9m go, yet over the 20 year period the average might still only be .5m. Therefore it is very difficult to say when the next fall will be although it could be substantially larger than what is expected to be the average.